Bows Grow Taut, Battle Approaches . . . .
Aaaaaaand, SCENE! Hi, y’all. Just wanted to drop a line before making a pre-emptive donation to the Anti-Defamation League. I’ve been off the blog for a while, but wanted to let you know of some things going on. First, I AM WRITING, but I’m probably not writing on the things you want me to write on. No progress on the sequel to ASID and only marginal growth on either Echomancer, or Demigod, my two young-adult urban fantasy projects. I’ve had a lot of short story stuff (as well as a lot of life) interfere. First, of course, I didn’t make it with the Baen Fantasy Award and my story “The Commuter”, but it is working its way through the magazine rejection files now, as is “Bumped”. Should they not make it, I might do a final polish and offer them through Amazon Singles (which is not a dating site. I stand corrected). My first new short story product is a definite WIN and I’m VERY excited about it. This is a quasi-sequel to an anthology of science fact and fiction regarding future warfare produced back in the 70’s and 80’s. 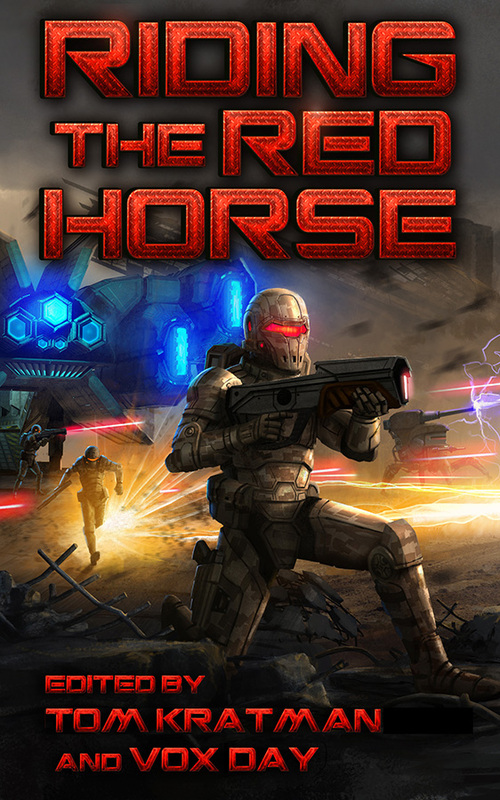 I forget the title of that one, but Castalia House is publishing an unofficial follow-up called Riding the Red Horse, an obvious allusion to the Red Horse of War. 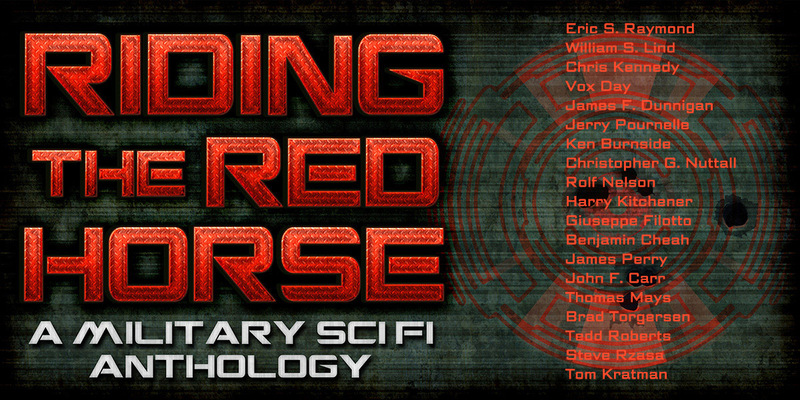 Headed by Tom Kratman and edited by Vox Day, the new anthology will include essays on the future of warfare, science articles, and a BUNCH of great new short stories by some of my favorite authors, including Tom Kratman and Vox Day, Chris Kennedy, Christopher Nuttall, and little old me. My story, “Within This Horizon” is under editing now, but I can’t wait for the book to launch and for you all to see it. The second bit of news requires YOUR PARTICIPATION! I have just submitted a story for The Writer’s Arena, sort of a short story Thunderdome (Two Stories Enter! Only ONE STORY LEAVES!!). They hold weekly fiction contests where each writer has a week to submit a story about the same particular topic. That topic may be AI gone awry, a carnival from Hell, or ghosts – madness or reality? Once both writers have submitted their tales, both stories get posted on the website and readers vote on the winner. These are short tales, usually under 4000 words each, and they are a lot of fun. This week the topic is AI gone awry, so do please go check it out and vote. Next week is my week, which deals with “fake” hauntings: either you have to describe someone who is a victim of a made-up haunting, or you have to describe a real haunting that won’t allow itself to be disproved. My story, “The Gaslight Consultant” will be appearing there in mid-October. I absolutely need your help and your judgment, with your vote going to the best of the two stories. And if you like it, consider supporting the site with a small donation, like what you would pay for a show or an issue of a magazine. So, that’s where I’ve been, Jewish Grandma. Now excuse me while I go prepare for next week’s battle!